As Summer winds down to an end, time to clear out the backlog of projects that are in queue for the Summer before the dreaded Back to School season. Debatably more fun than Orthogonal Functions or solving Matrices by hand, let’s DO THE MATH with the Atari Jaguar and make our own Composite/S-Video combo cable. 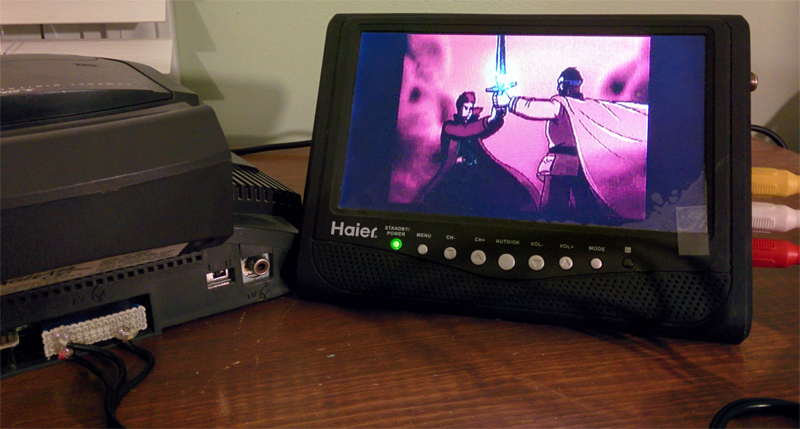 While the Jaguar’s RF is not on the levels of NES2 jailbar mess the picture is pretty terrible all the same, with a fuzzy, Bleeding Color Edged, interference nightmare that gets even worse with the CD attachment connected. So what are the other available video options? Atari did make some official cables as there is a Composite Video cable and a S-Video cable, but not both outputs together in one (at least that we could find). Another option is BCD/ICD’s CatBox, but that has been out of production for quite a while now and is now rather expensive in the Collector’s market. With all that in mind, what is left? Make your own cable, of course! 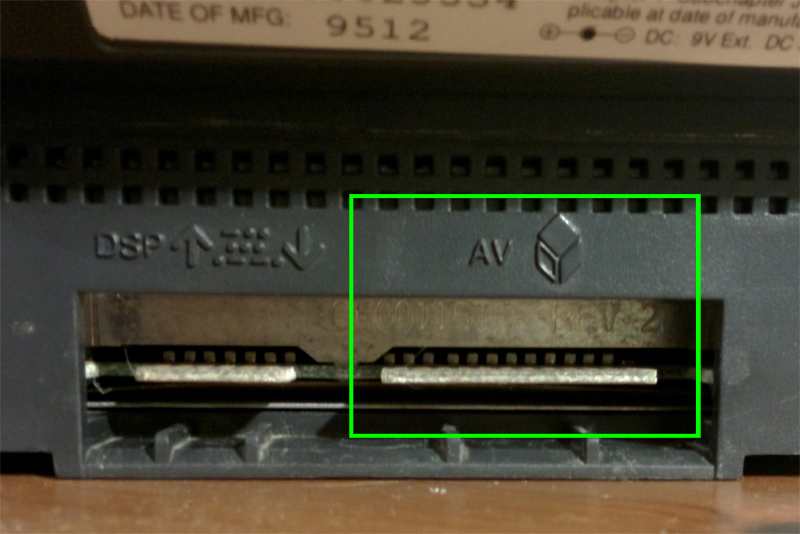 By some sort of happenstance, I suppose cost cutting but surely not entirely coincidental for the most part, the A/V section of the edge connector found in the gaping hole on the back of the case is the same footprint of the Atari 2600 cart slot! 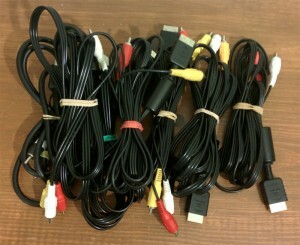 Having a handful of extras on hand from our Atari Flashback 2.0 cart mod, making our own cable makes sense. 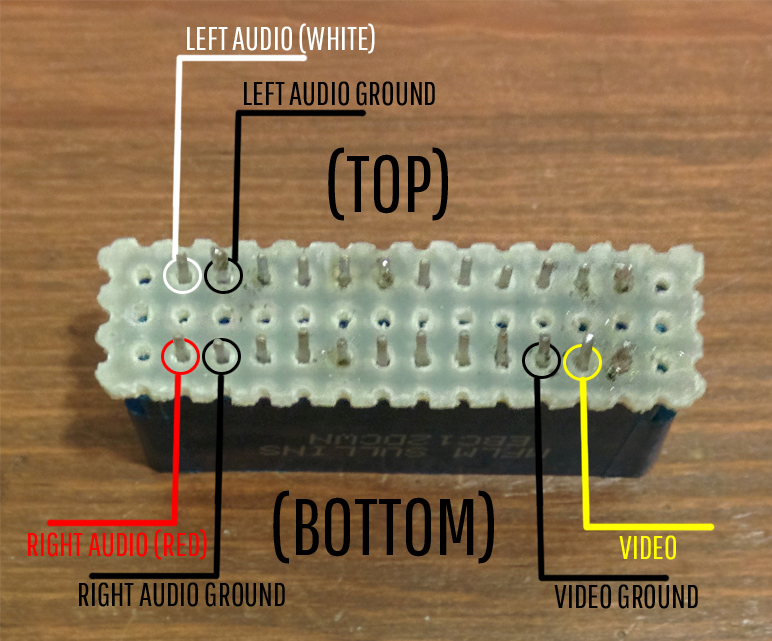 This How-to Series will be split into separate features to cover each of the video signals available from the pinout, starting with Composite and S-Video while ending with the creating a 3D printed enclosure to close out the series. RGB is also possible, but not having a “True” RGB-out device here in the shop, the RGB portion of the cable will possibly come sometime in the future. While looking through some cables to find a suitable donor, I noticed that I have a few Playstation A/V cables to spare, to say the least. One was found one with a wonky serial connector, so it will be repurposed for this project. Alternatively you can use any console’s A/V cable that you have a spare of, or a standard RCA composite video cable (which you could cut in half and make 2 Jag Video Cables!). YMMV of your location of course but you could easily find a cheap, suitable cable of any sort at a thrift store if you don’t have any spares laying about the house. 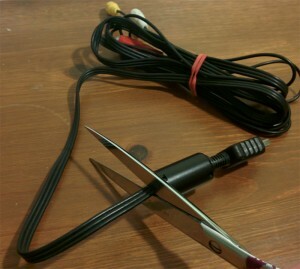 Once you cut the cable open, all the documentation noted here is the same no matter which cable you decide to use. Measure out how long you want your cable and chop off the end connector. If you are going to follow along with our Series and will add S-Video connections to your cable afterwards, you’ll want to have them around the same size so don’t cut off too much or too little, depending on your available S-Video cable (but more on that later). 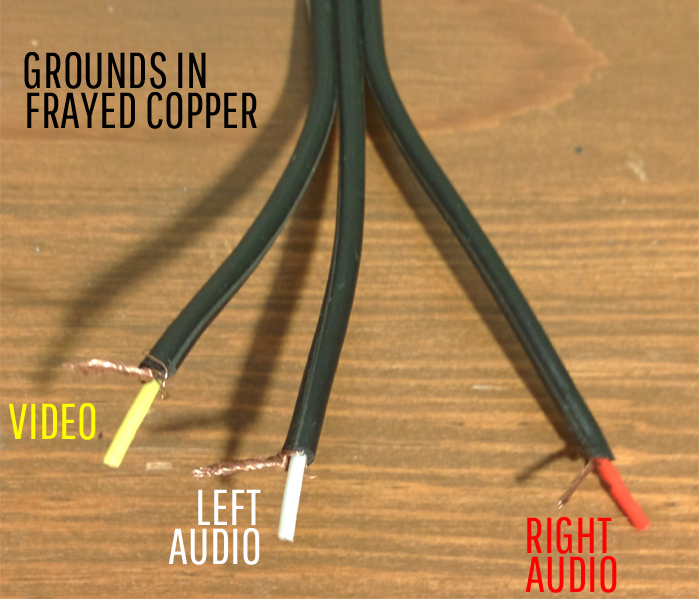 Separate off each wire into sections and strip off the outer casing, but make sure to take caution to not sever or completely cut off the wires inside or any of it’s frayed grounding. In this instance, the color of the wire matches the usual color pairings of the standard RCA jacks on the cable. While this is usually the case, it is best to use a multimeter and test the connections to double check their function and avoid any issues or confusion later. Again using Digikey Part S3304-ND, cut a piece of perf board a little bit bigger than the cart slot itself to hold the connector in place for the 3D printed enclosure and also to make it easier to grab out of the back of the jaguar when testing. You can measure out the appropriate size to cut by counting the holes, so 14 wide x 3 tall is what to aim for. 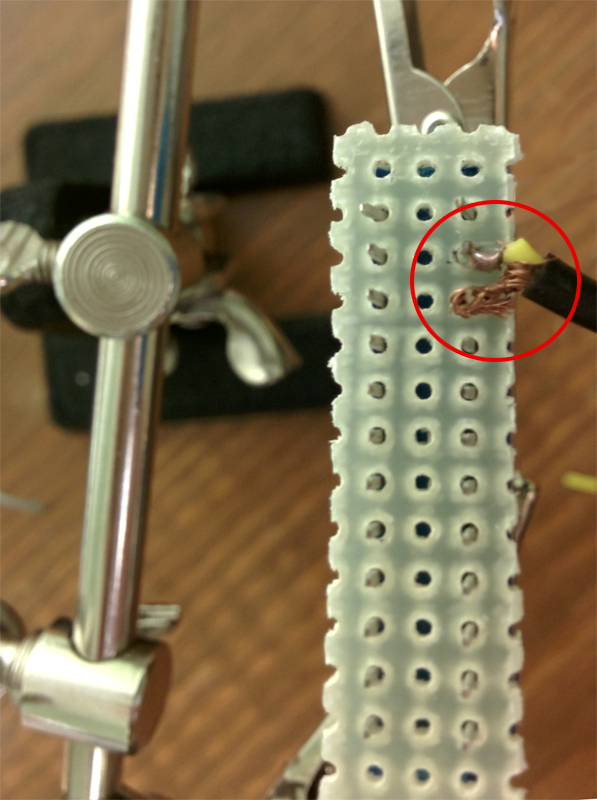 If you plan on using Helping Hands or any sort of clamps or clips to hold the connector in place, a good tip is to insert a piece of perf board for the clips to grab on to keeping the connector firm in a vertical fashion for easier soldering. Make sure the frayed ground is under control and not hitting any part of their correlating connection as that will cause it’s feature not to function. 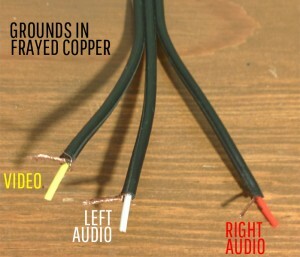 It is best to solder them in pairs as they are side by side with each other, so video & video ground, left audio & left audio ground and so on, also allowing you to test every set of connections in pairs if you wish. 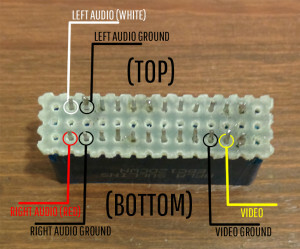 It doesn’t matter in which order you go in, but since the pinouts for audio left (white) are directly above audio right (red), it is suggested to do audio left first before audio right for more workable area in connecting the wires. Those six connections are all we need on the connector for this part of the mod so plug it into the Jag and fire it up. Make sure you insert it correctly; the video connection will be on the lower right. Test each audio channel by keeping only one cable plugged into your tv at a time. 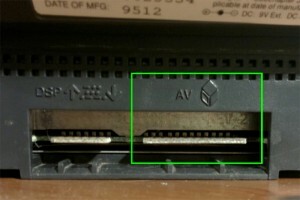 For troubleshooting (other than making sure the cable is inserted properly and not upside down), if you do not see a picture or one of the audio channels is not working, check to make sure the frayed wires from the grounds are not touching any other connection as that will cause it not to function. There Can Be Only One! (Video Input). If everything works as it should, sit back, relax, and groove on some Tempest 2000 in Stereo until next time when we will add S-Video connections to our cable in Part II.